First: today my blog is being critiqued by the awesome and wonderful Laura Barnes over at Laura B Writer. She's running a series of blog critiques to help us all learn how to do things better, and I'm the second to go. Her blog, in general, is a font of valuable information about marketing and how we, as writers, can make the most of our presence on the web. Please check out her blog if you haven't - you'll be glad you did! Third: this week's theme for Fun Friday Foto Fextravaganza (which I hope you are REALLY impressed that I'm remembering to post today instead of forgetting until Wednesday :)) is PUMPKINS/JACK O'LANTERNS! 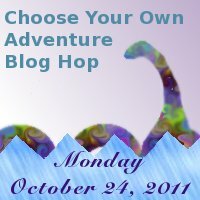 Fourth: I hope you're all getting excited for the Choose Your Own Adventure Bloghop next Monday, October 24th!!! Fifth: (I told you there was all kinds of stuff going on today!) I spent the weekend at the New York State Sheep and Wool Festival. Really, if you've never been to such a thing, you owe it to yourself to go. Sheep, llamas, alpacas, gorgeous wool, knitting and crochet meetings and books and patterns and products - WOW. It's a whole world I knew nothing about and it makes for a lot of fun! Anyway, there I was, signing copies of Can't Sleep Without Sheep, when a woman came up to me and asked me to sign one for her daughter. "How old is she?" I asked, pulling a book from the pile and uncapping my pen. "Well," said the woman, "she was just born a couple days ago. She was premature, so she's in the NICU, but she's going to be fine." But here's the kicker. The woman went on to say, "This will be her very first book." Can you believe it? I was so honored! To think something I wrote was going to be the very first book in this child's library; that one of these days, that mother will sit with her little daughter and read Can't Sleep Without Sheep to her. How special is that?! I am tucking this one away for those moments when I'm afraid my career is over and I'll never sell another story (well, that would be right about now!) so I can pull it out and look at it and remember something good. And finally, the moment you've been waiting for! STRAIGHT FROM THE EDITOR! Here are my thoughts about your pitch: It is a little confusing. “Talking to herself-in-twelve-years” doesn’t quite get across the idea that she’s talking to herself in the future. I had to read it a few times to get that. You might want to just say her future self. Also, is the relationship impossible because nobody can talk to themselves in the future or because she doesn’t get along with herself? I don’t think you want to use that word impossible. Perhaps just go with relationship. Keeps it simple and to the point. Also, “fueling her destructive self-loathing” leads to more questions and could possibly turn an editor off. It might be better to give the resolution so that the editor might be intrigued as to how it happens. See what I’ve done. Do you think it gets the main point of the story across? If not, then you need to rework it so that it does. Perhaps be more specific than bullying or unrequited love. Stacy can talk to her 26 year-old future self. But will her relationship with Older Stacy help her successfully navigate the high school rites of bullying and unrequited love, or just make things worse? Lastly, fyi, there is a young adult novel coming out in November by Jay Asher and Printz Honor-winning author Carolyn Mackler -- THE FUTURE OF US, in which two best friends log onto AOL in 1996 and discover a window to their future Facebook selves. Razorbill is publishing it. It sounds very similar to yours and I just wanted you to know it was out there. I hope you all find Erin's comments as interesting and insightful as I do. Not only does she bring her experience as a career editor, but she knows what else is out there. So, are you feeling revved up and rarin' to go for your week now? You're chock full o' information today! A blog critique? What an interesting idea. I'm going to check it out. It is awesome to get her advice AND yes, I am all revved up for the week! Thanks for the donut. You've got so much awesome stuff going on - I love it! First of all: donuts get me every time. *sigh* I'm on a diet. A donut diet! Ha! I voted. That idea sounds super fantastic. How'd you get so smart. And I'm in line for the blog critique, too. I'd forgotten about it until now. Guess I'd better mosy on over to see how I might fare. Gosh, quite a bit going on. I love Laura's critique ideas. Now I'm roaming around your site. Any takers on The Preacher's Bride. It could visit Colorado? I appreciate Erin's comments. This series is very helpful. Robyn - thanks for voting. I think this could be so fun! I hope someone will speak up to be the first to receive the book, whichever it turns out to be! Janet - I'm patient :) You can send your pitch whenever it's ready! And Laura is terrific - I'm sure she'll be nothing but helpful and your blog will fare VERY well because it's fantastic! Stacy - I love Laura's ideas too! I had been thinking of something along those lines - not quite the same - but now I've got some more ideas! And no one else has spoken up for The Preacher's Bride yet, so it's yours! If you want to email me your address, I'll send it along! Boy what a great critique you got! I just put my name in the hat too. Also - her FIRST BOOK??? My heart melted when I read that. I can't even imagine how elated you must have been. P.S. I SO want a pumpkin donut now!! Wow, that was an amazing rewrite to the pitch. I saw the blog crit this morning. Laura had some amazing suggestions. Julie - it's a great thing Laura is doing - so helpful! And yes, I was so touched to be the writer of her very first book! Your blog critique was ace, well done you. I was surprised about the teachers resources, I don't think it would be as much of a stretch as I previously thought. I want one! Thanks for the mention :)I hope you get some takers. Great feedback for that pitch too, aren't you full of awesome today. Have a great week. Wow, what an awesome post. So many cool topics in the one post. It touched my heart when I read about your 'first book' experience. That would've been amazing. And I love Erin's suggestions for Aimee's pitch. For me, it gets the key points across, is very easy to read, and grabs my interest. I just love the idea of a journey book. What a terrific idea, and how fun it will be to share your book's journey with kids. Great post,Susanna. 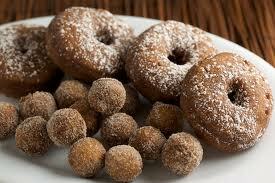 Enjoy the pumpkin donuts! I'm off to make a pumpkin pie. You're welcome to drop by. Cally - I'll ask Stacy if she'll send you the book when she's done! Those donuts look awesome! There was another book a bit similar to Aimee's - I think it was called Gimme a Call by Sarah Mlynowski - where a girl finds a cell phone that can only call her 13 year old self (or something like that, maybe I have it backwards). Your book is that child's first book - that is amazing! Definitely, cherish that. That is so cool, about your signing the baby's first book! I'm sure it will be very special to her. Oh, shame on you for making me drool over those pumpkin donuts. :) I'm seriously gonna have to take a munchie break now. Susanna your blog is a fun place! I especially like the book journey idea, and that's such a sweet compliment that your book will be the first in that child's library--congrats! Oh and thanks for the virtual pat on the back regarding this week's angst over my teenager! Brooke - thanks for the heads up for Aimee - I'm sure she'll appreciate it. And it is so wonderful and special to have the honor of having written little Sophia's first book! I loved the post Laura did about your blog, Susanna. And speaking of things I like, Jody Hedlund's book THE DOCTOR'S LADY was a very enjoyable read. I can't wait to hear your thoughts about the book. Where to start at such a late point on a great day of posts??? Can't wait to experience the blog hop- that is such a cool idea. Remind us next Monday please- I know I'll need it :). I would have cried if a brand new mother had asked for a signed copy of my book to be her child's first book. What an honor! I need to see the blog critique- maybe it will motivate me to spend more time on my own blog. Excellent edit on the pitch. What a great resource. Thank you for sharing with all of us. There is so much to learn here. I think I need a pumpkin donut tomorrow for breakfast! I LOVE them. Michelle - well now that I've read The Preacher's Bride I'm looking forward to The Doctor's Lady! A2Z Mommy - well, I guess I can call you Tracy now :) - I'm glad you're looking forward to the bloghop - just try to stop me from reminding you :) And it was such an honor to sign that child's very first book. Definitely check out Laura's blog - it's fantastic - chock full of really insightful, helpful info!